From the inside gatefold cover (Partch's artistic statement): The work that I have been doing these many years parallels much in the attitudes and actions of primitive man. He found sound-magic in the common materials around him. He then proceeded to make the vehicle, the instrument, as visually beautiful as he could. Finally, he involved the sound-magic, and the visual beauty in his everyday words and experiences, his ritual and drama, in order to lend greater meaning to his life. This is my trinity: sound-magic, visual beauty, experience-ritual. Reading Partch's statement might help the listener understand his approach. My first impression was that I was listening to a single stream of sound, that featured few "intersecting devices" and that the stream may have have been created by someone (with a rhythm sense) who had just discovered a room full of instruments and started to bang away for the fun of it. Much of the sound created by Partch also reminds me of the structure I hear in Gamelan (music from Java and Bali, Indonesia). Barstow (side 2) is different in that the vocal overlays help to create a more dense sound experience. The vocals also create "Zappa-like" moments in the work. At least that is what I hear. I don't know what Partch's conceptual influences are. Partch used a made-up term "Hobo Concerto" to label the narrative. If you want more of a break down, I suggest finding a copy because the book-fold is bursting with copy that explains each track in depth. 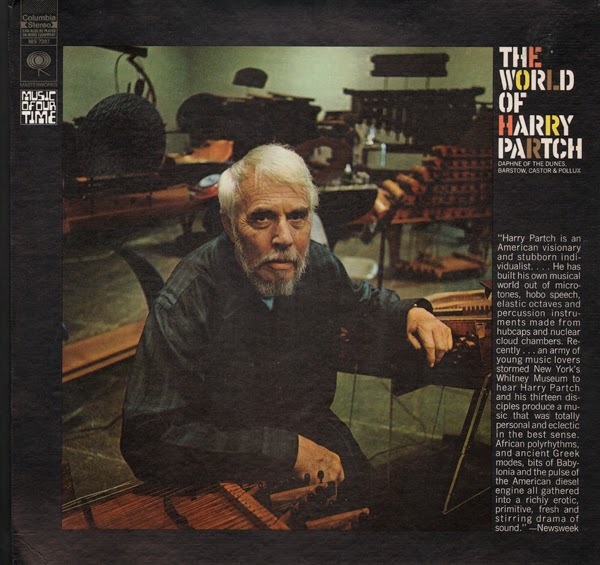 From Billboard - May 3, 1969: Current interest in Harry Partch should be parlayed into interest for this disk from one of the most individual of today's composers. The original instruments as as fascinating as their use here. "Daphne of the Dunes" and "Castor and Pollux' are engrossing instrumental pieces, which benefit from the originally of sound as well as construction. The narratives in "Barstow" enhance that piece. 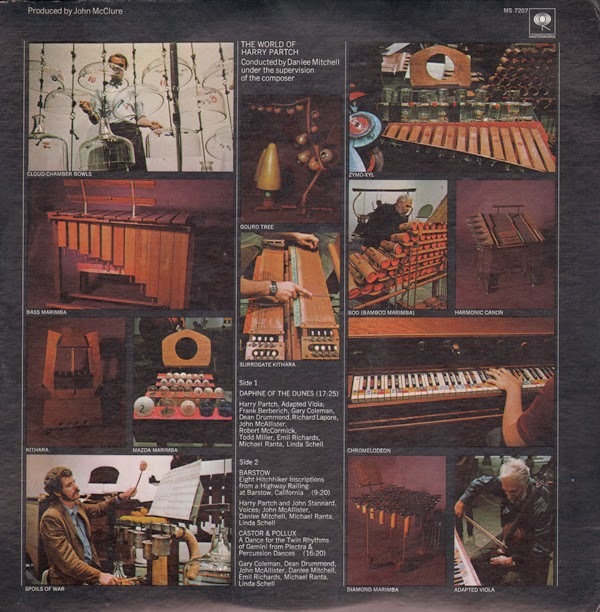 Harry Partch and John Stannard, Voices; John McAlister, Danlee Mitchell, Michael Ranta, Linda Schell. Gary Coleman, Dean Drummond, John McAllister, Danlee Mitchell, Emil Richards, Michael Ranta, Linda Schell. Wow! The beginning of your track Barstow was used in Dr Demento's Funny Five countdown for Number One. Neat!